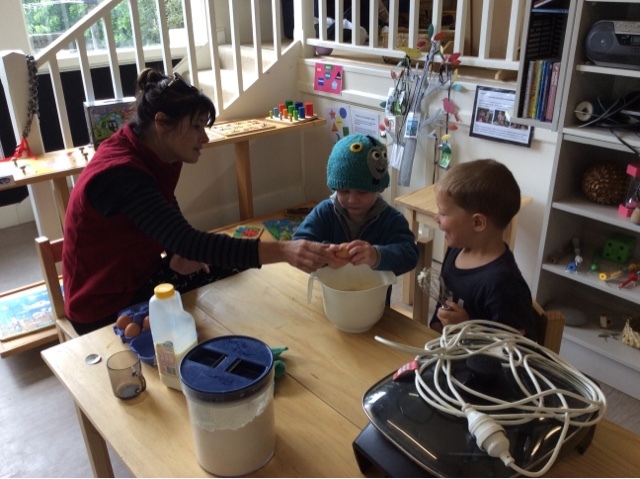 This morning some of the children asked Sandra if they could do some baking so they set to finding the ingredients to make pancakes. 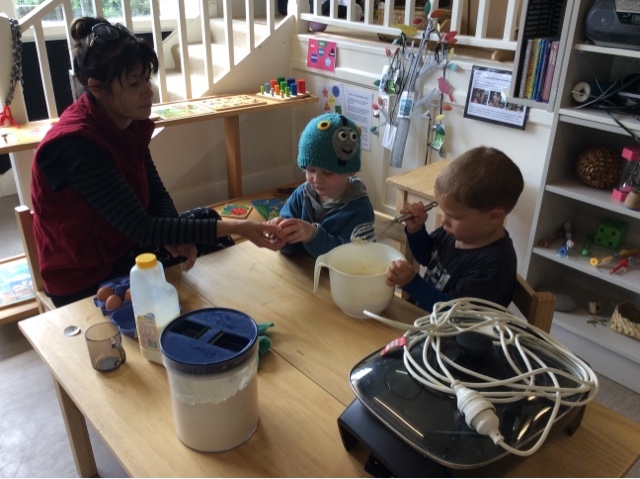 Together they strived for accuracy as they measured the ingredients and showed each other how to crack open the eggs to mix in.We work together for maximum impact , Ka mahi ngātahi mo te tukinga nui tonu. 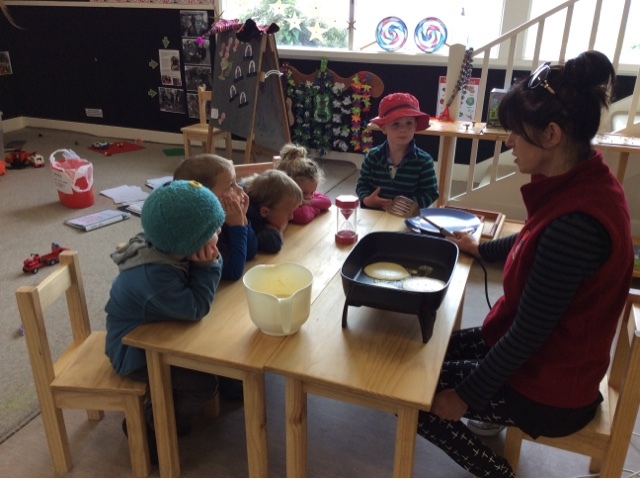 As the pancakes began cooking Sandra asked the children how they would know if the pancakes were ready to flip, one shared "The timer will beep" then another jumped up and grabbed the egg timer to see if it was ready when the sand had run out. 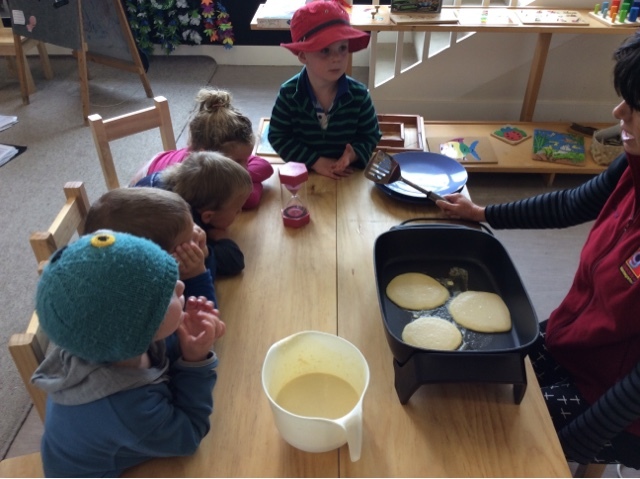 The children managed their impulsivity and keep their hands away from the pan as they waited patiently the timer ran out and it had to be turned over again before the pancakes were ready. The children were all very excited to figure out that it takes two times for the timer to run through before the pancakes were ready. 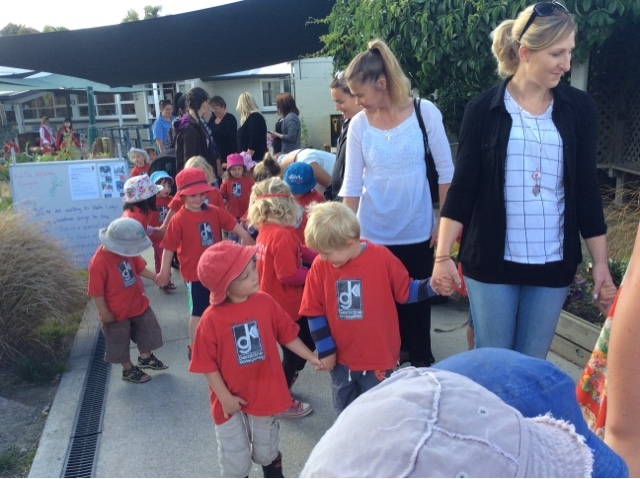 This morning the children were lucky enough to be showing jacqui Dean our local MP for National, around kindergarten after she had been looking at the Geraldine Incredible Edible gardens around our area. 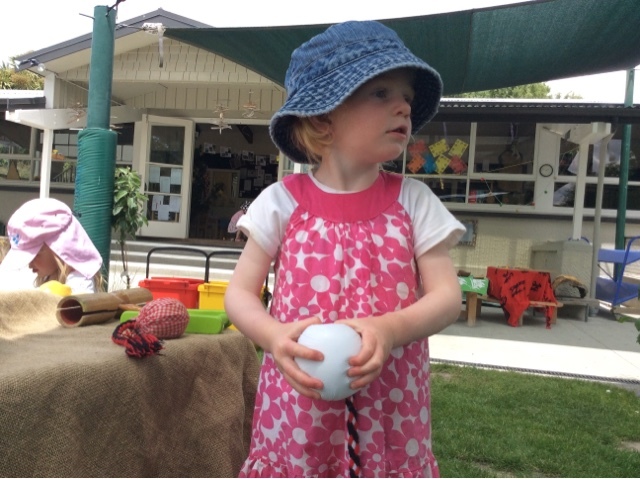 Whanaungatanga/ relationships is something we value highly here at kindergarten and the children took such pride in showing her out kindergarten gardens while she was visiting. 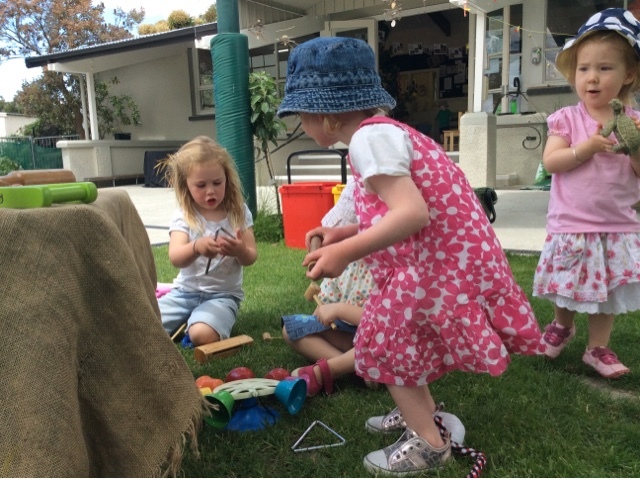 This afternoon, some of our children discovered the musical instruments outside, they showed lots of manaakitanga/ care and respect as they shared the instruments with each other, clearly articulating their ideas as they went. Ka rawe, How lovely. We had lots of fun using our hand eye coordination as we tried to hit the different types of instruments to see what noise or sound they made. 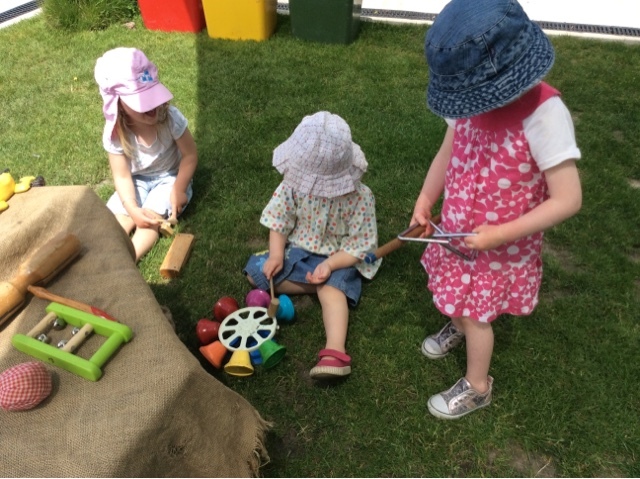 Squeals of excitement could be heard as they discovered how each instrument worked. 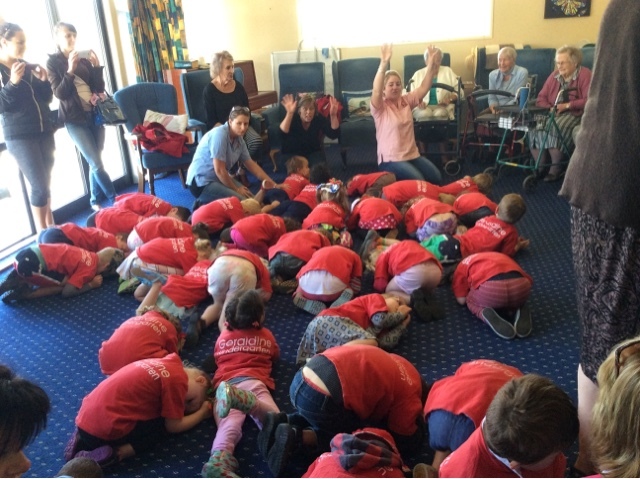 We were ready to go for our annual excursion to Waihi Lodge! 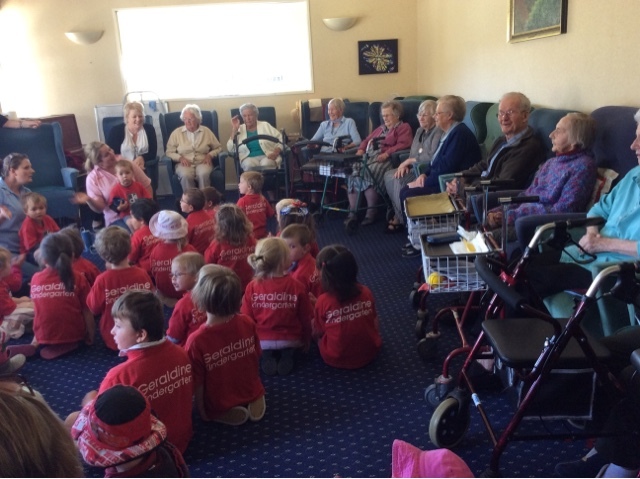 The children were curious if they were going to be going today because throughout the year we have the practice to take a group out in the community every week and therefore only a small group go each time. Regan and Kayne were the most curious and asked if they were going and so Ashliegh got the red t-shirts and put them on the children as they arrived this morning. This clearly indicated to each one of the chidlren that they were going for a walk today. 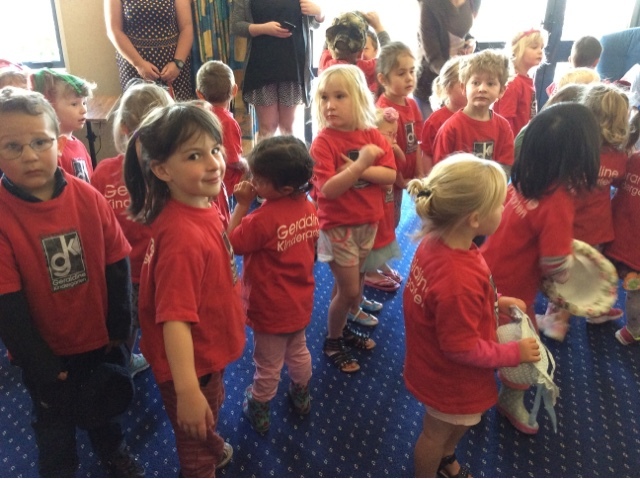 We arrived with a sense of excitement and was invited into the lounge to what started out being a small audience but it grew as the wonderful Christmas music and singing of the children could be heard. 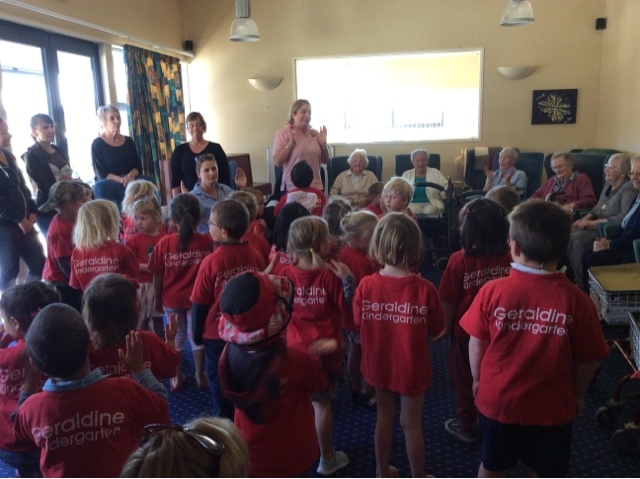 We hope the residents of Waihi Lodge enjoyed it as much as the children loved singing and we could tell the children were enjoying being the entertainers as they eagerly partcipated with voice and movement of each of the songs they have practiced at Kindergarten. 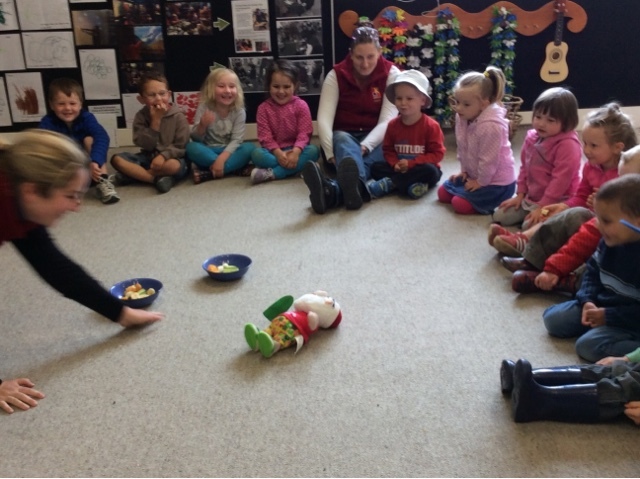 Singing and dancing is a magic way for our children to show how well they work together/mahi tahi! Christmas would not be the same without a visit from you know who! He came with his jandals/thongs surfboard and sunglasses and stepped to the beat of the music! We discovered that children love the unexpected and when Father Christmas lost his balance and fell over backwards they laughed out loud! 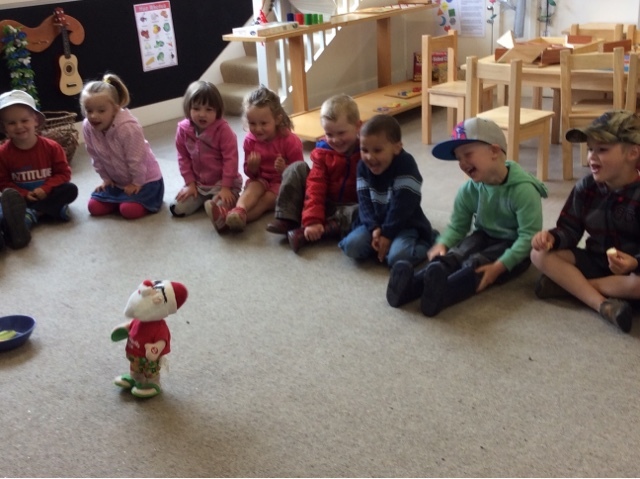 We find humour in different ways but this little Father Christmas and his actions had all the children in awe and they all laughed at every move he made. Where else in the world would you have a small man who adores the centre of attention and attracts the most laughter from children! Roll on Christmas and all the cheer it brings! 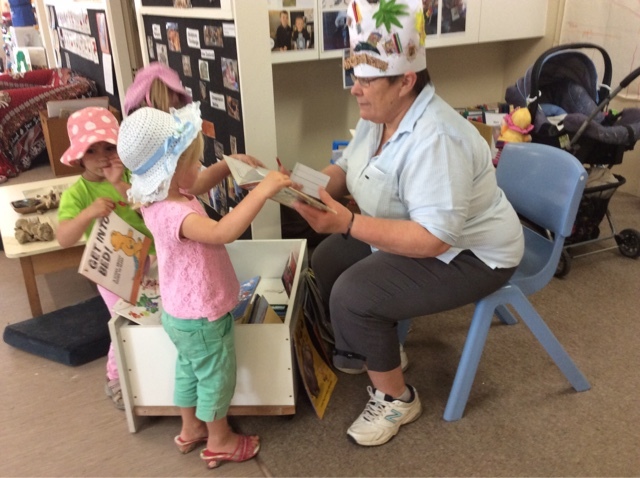 This week we celebrated Helen's contribution at Kindergarten with the Library she organises every Thursday. We are so lucky to have Helen coming in each week and supporting our children in choosing a book to take home and read. This not only supports their early literacy skills but builds on those important links between home and Kindergarten. 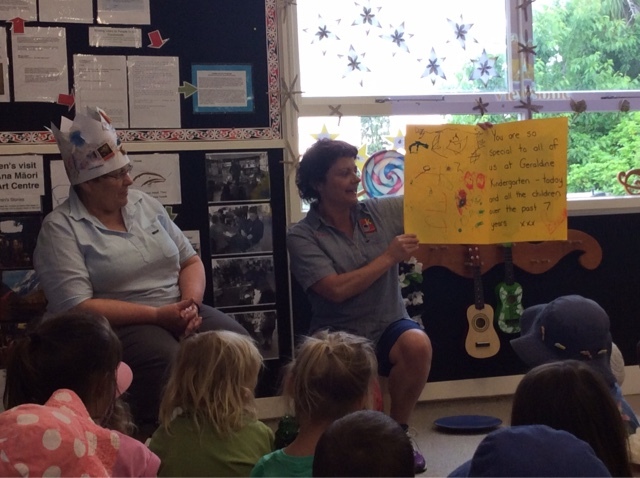 Children learn about manaakitanga/ care and respect as they look after their kindergarten book carefully at home and then be responsible for returning it on time, ready to choose a new one. Helen has been running the Library for over 7 years! Āe mārika! How about that! 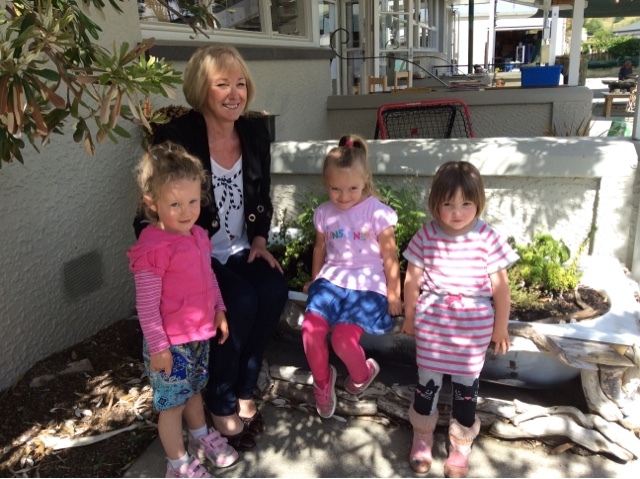 Over that time she has built wonderful relationships with the children and their families. 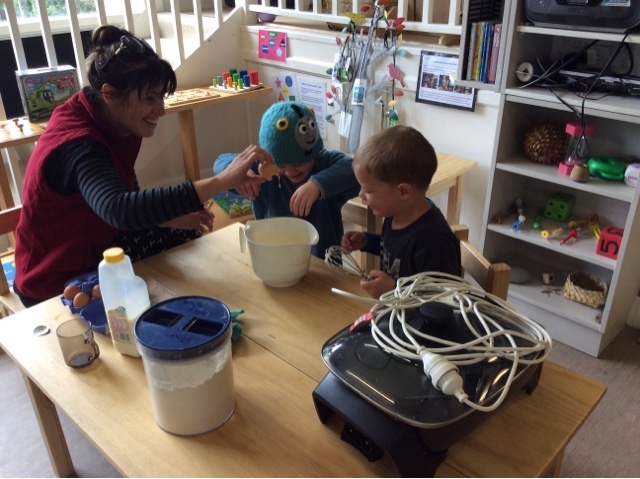 Helen gets to know children's particular interests and then helps them find a book that might further extend their thinking and imagination. So thank you Helen! She is a very important part of Kindergarten life.